The moment that Clemson nation has waited for has finally arrived. Clemson head coach Dabo Swinney can turn the Deuce loose. After a tumultuous off season, sophomore sensation Sammy Watkins will finally put everything behind him and just play the game he loves. His first victim will be FCS opponent Furman, who makes the short trek from northern Greenville to Death Valley Saturday at 3 p.m. The Furman Paladins come to town with an 0-2 record after suffering a triple overtime loss to Coastal Carolina a week ago. They will also be starting a new quarterback in Greer native Reese Hannon. Even though Hannon will be making his first start, he showed a lot of promise last week as he threw for 255 yards and four touchdowns after an injury to starting quarterback Dakota Derrick. Hannon, who grew up a Clemson fan will be looking to make a statement in Death Valley- a place that he has watched many Clemson games. Hannon will target senior tight end Colin Anderson, who led the team last year with 40 catches for 696 yards and seven touchdowns, making him a consensus All-SoCon selection. The Paladins will try to establish the run game early, knowing that the Tigers gave up over 200 yards on the ground to Ball State last week. Sophomore running back Jerodis Williams will lead the running attack after rushing for 1,055 yards in 2011. Clemson gets its most explosive player in Watkins back for the first time in 2012 and you can bet that offensive coordinator Chad Morris will figure out how to fit him into an already successful Clemson offense. Add Watkins in with running back Andre Ellington, quarterback Tajh Boyd and receiver Nuk Hopkins and I’m not sure that the Paladins have enough men to stop Clemson from scoring on each offensive possession. The Clemson defense has received a ton of criticism during the first two weeks of the season and rightly so, but one thing that has been overlooked is the fact that an area of the defense has improved each week. The defense was porous outside of the defensive line against Auburn, but the secondary was much improved against Ball St. holding the Cardinals to less than 150 yards passing. This week could be the week for the linebacker and defensive line to step up their game and stop the run. 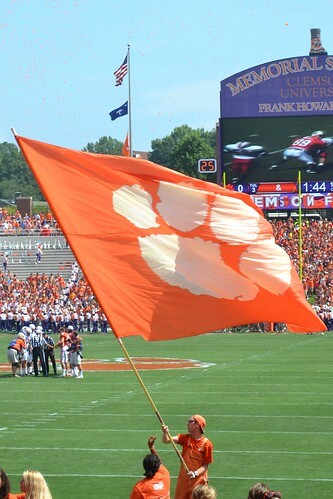 CLEMSON’S RUN DEFENSE: The Clemson defense has given up 432 yards on the ground in the first two games, and if the Tigers want to be successful they have to stop the opposing team’s ground attack. There aren’t glaring deficiencies at any position in the defense- it is simply a lack of experience and fine-tuning the details of defensive coordinator Brent Venables. Venables has challenged his defense to step up and be tough against the run , and I think that stopping Furman on Saturday will give the defense a huge boost of confidence before they go on the road for the next two weeks. THE SAMMY WATKINS FACTOR: Tiger nation and college football fans everywhere have been waiting on the return of Watkins to see if he can build on his record-breaking freshman season or if he was a one-year wonder. All of the media-types at the game will be tracking Watkins’ touches to see how many passes he gets thrown his way, how many times he runs the ball and how many returns on special teams he gets. This will just be a warm-up for Watkins and the Clemson offense, because I feel almost certain that Morris is keeping his offensive playbook under wraps until next week against Florida State. THE EMERGENCE OF YOUNG STARS: Last week, Swinney was able to play 80 players against Ball St. and I expect this week to be no different. The young reserves will get a chance to show what they are made of and earn the respect of their coaches and fellow players. Who will step up and who will see their last action of the season? Linebacker Tony Steward should see a lot of game action after being injured last season with a torn ACL. Freshman running back Zac Brooks needs to gain game experience so that he will be ready to contribute next season with the departure of Ellington. Punter Bradley Pinion will also be called upon this weekend to gain more consistency in his game to hopefully give senior Spencer Benton a break from all of his duties. WHAT WILL HAPPEN: Furman has always been known as one of those teams that can cause trouble for the big boys in college football beating the likes of Georgia Tech and South Carolina. They also gave Florida a little scare in the Swamp last season. However, Clemson just has too many offensive weapons for the Paladins to have much success defensively. This game will be very similar to last Saturday, meaning that the starters will get an early break after gaining big lead and the reserves will get to come in and show their stuff.